Maureen J. Simon provides a strategic women’s leadership consultancy specializing in facilitating, supporting and mentoring women leaders in business development, advanced communication skills and conflict and change integration. As an American and Irish citizen, she blends years of experience in international business consulting, marketing, and community development, including serving to mediate political conflict in Northern Ireland and Eastern Europe. Her work in the conflicts of Moldova and Belfast has provided a depth and understanding of the world and human nature that has deeply informed her work. Many are Fortune 100 corporations and include executives from Vogue magazine, Pricewaterhouse Coopers, the BBC, Hewlett Packard, Comcast, PBS, Barclay’s, British Rail, Chevron, and North London University. Other areas of accomplishment and affiliation include her service as: a licensed lobbyist with the New York State Legislature; a consultant with Cornell University working to establish pre-school facilities and programs serving over 2,000 children; a developer of large-scale private and commercial real estate projects; a director of a New York-based community foundation and vice president and marketing director, Cala Records, London/New York. Maureen has steadfastly based her work on her strong belief that our emerging world culture needs, and is now demanding, that women step into their rightful power and leadership roles. 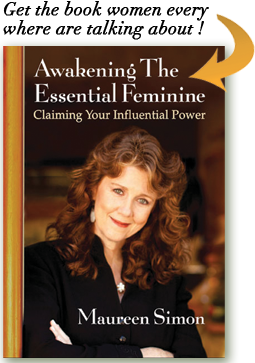 After a year and a half of research on the feminine attributes of women, she is putting forth her ideas and beliefs in a book entitled “Awakening the Feminine–Claiming your Influential Power in Business and in Life. She speaks on this topic in seminars worldwide. Maureen’s work has been featured in numerous printed publications, including London’s Vogue, Marie Claire, Self, Women & Home, Good Housekeeping, Bay Area Business Women, Marin Independent Journal, The Financial Times, and many others. She has appeared as a regular guest for the London Broadcasting Corporation as well as numerous other radio engagements in both the U.S. and England. For the last three years Maureen has been co-author of a weekly blog – providing over 200 world- wide web entries to the Global Dialogue Center (www.globaldialguecenter.com) site. She has held numerous worldwide tele-seminars co-facilitating with the top-level executive team at HP using Microsoft Live Meeting facilities. The last seminar was held on International Women’s day and was attended by 112 women from 12 countries. She served as a founding member of the Global Women’s Leadership Network at Santa Clara University’s Leavey School of Business in Silicon Valley creating a dialogue process that brings hundreds of women together in dialogue. Cisco and other Silicon Valley corporations have brought the model into their companies to facilitate innovation. She maintains active consulting businesses in London, England, and the San Francisco Bay Area. She is a graduate of The State University of New York.